It's BIG, it's LOUD and it's LIVE ... coming to a movie theater near you. Experience live performances of the top 17 corps from the 2006 DCI World Championship Quarterfinals on Thursday Aug. 10, at select movie theaters. The program starts at 6 p.m. Eastern / 5 p.m. Central / 4 p.m. Mountain / 3 p.m. Pacific. Tickets are $18. Tickets go on sale Friday, July 14. Seating is limited, so order early to guarantee your place on the 50-yard line for the one of the biggest events of the drum corps season. 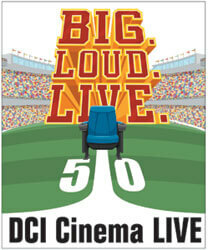 To purchase tickets online starting July 14, visit www.BigScreenConcerts.com. Tickets also can be purchased at the presenting theater box offices. Tickets for Georgia Theatre locations are not available online, but may be purchased in advance at the theater box office beginning July 14.